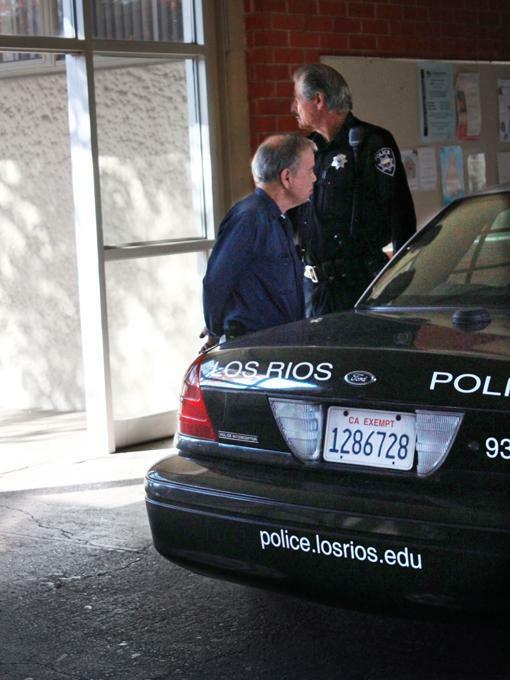 Officer Frank Smith arrests a man outside of Business 123 around 1 pm on Monday Nov. 25. Reporters for The Current observed campus police arresting a man outside of Business 123 early this afternoon. Officer F. Smith walked the handcuffed man to a patrol car after police looked through the four bags that were pulled out of the classroom along with the detainee. Police referred reporters to Sgt. Olsen for information regarding the arrest. Students in the class with the arrested individual did not know why the police pulled the man out of class. The Current will update the story as more information becomes available. Be the first to comment on "Man arrested by campus police"